Lupinranger vs Patoranger’s final arc continues this week, in explosive form! On the Kamen Rider side of things, Kamen Rider Zi-O’s Ghost Arc begins, and Decade returns! Let’s dive in, shall we? All seven rangers are forced to come together to battle the Gangler general Destra this week, after being soundly defeated on their own. The battles have weight and consequences, which is always a refreshing touch and a good way to ground the show in a realistic setting, including injured rangers and the city being evacuated. Even the police, minus the Patorangers, are evacuated so Destra can be dealt with. A surprising source of conflict, though, comes in the form of Kogure asking Noel to step down from his duties as Lupin X.
There’s a bit of intrigue here as well, as the preparation for the fight spends a lot of time focusing on how each red ranger thinks he can use the other. Kairi knows Keiichiro will protect people, and Keiichiro, in turn, counts on Kairi’s greed and lust for the collection to guide him. In the end, both men behave as the other predicts, leading to Keiichiro actually saving Kairi’s life. After forming Good Cool Kaiser X, the rangers are paired up based on their roles, with Noel, Kairi, and Keiichiro making up the “head” or lead section of the machine. Touma and Tsukasa end up on one side, with the remainder going to Sakuya and Umika. It makes for a brief but interesting exchange, and once the moment passes, the rangers get down to business and take on Destra. This week kicks off the Ghost Arc of Kamen Rider Zi-O, and features some big moments and returning characters. Kicking things off, we first meet Tenkuuji Takeru, Kamen Rider Ghost, and actor Nishime Shun returns to fill the role. Another Ghost appears, and Woz throws his lot in with the Time Jackers?! Though we are not told who he means, Woz tells Swartz, Hora, and Uhr about a man who will alter the course of history in regards to Oma Zi-O’s rise to power. It’s implied, at first, that this is Geiz, coming off the heels of Woz revealing his book can no longer accurately predict the future. It is a history book from a specific timeline, after all. As Another Ghost continues to attack, Sougo, Takeru, and the others begin to discover a method to its seemingly chaotic attacks, and find that it is targeting people whose actions cause accidents resulting in the injury or death of Innocents. This starts with a factory, then a hot dog cart with a gas leak, and at the factory site, we learn that Another Ghost is, more or less, a zombie. The identity of Another Ghost is revealed in a way that paints it as a tragic figure, the Time Jackers using the man behind the mask for their own means. When Decade does appear, he is using Agito form and the Neo Decadriver, and takes on Geiz and Sougo before leaving. An interesting point is that Decade is firmly with the Time Jackers here, if only to fill his normal passing-through role. Hora even offers to back any succession to power Decade might want, though he refuses. In the final moments of the episode, we get to see Takeru shine, as Sougo is seemingly killed and Takeru is the only one who can see or communicate with the ghost left behind. I feel as though this would have been a slightly better way to resolve the “two Sougos” problem caused by the Gaim arc, but this could certainly still lead to some interesting developments. Personally, I am looking forward to seeing more of what Decade will bring to the table in the following weeks. This movie has been out for a while, but in the lead up to covering the current Garo series, Jinga, it seems appropriate to start with this movie. 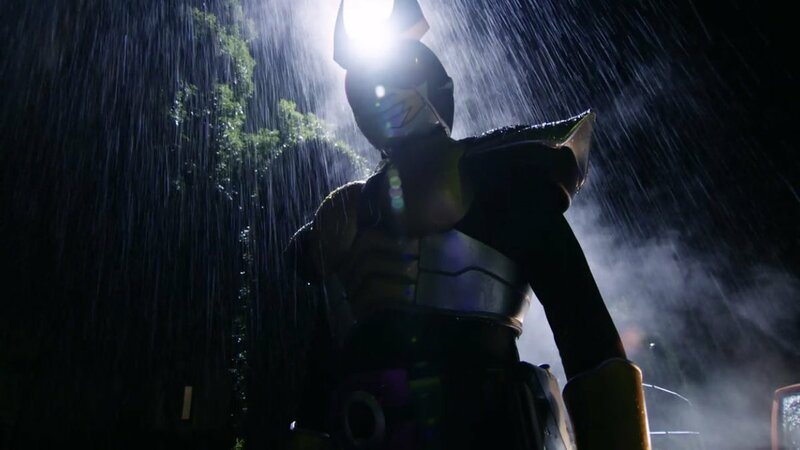 The movie focuses on a group of horrors trying to use a dark makai knight to power an ark called the God’s Fang (Kami no Kiba), on which they will build a new world. The movie is set in the Dougai Ryuga universe of Garo, latest in that timeline on its release. I highly recommend this film for anyone interested in watching the new series, but cannot recommend it as an entry point, as a lot of the plot points rely on prior knowledge of previous Garo series, characters, and lore. However, for veterans, this film marks a return to form for the live-action side of Garo. To set up this ritual, this ark, a Makai priestess named Banbi begins stealing the armours of veteran knights, and this is how we meet the returning characters from the other Ryuga-verse Garo series. The new Makai Knight, Jinga, is played by Kamen Rider Decade’s Masahiro Inoue, and is at once a madman and a warrior. The contrast, as well as his horror powers and fighting ability, set him up quickly as a threat, with three knights and a priest unable to defeat him at first. Though the end of the film doesn’t directly set up the next tv series, it is fittingly cinematic, with the cgi-heavy armoured combat being well choreographed, if at times a bit too jarringly quick. Overall, I recommend giving this film a watch, if only to keep up with Garo continuity, and especially if you plan on watching Jinga. The series itself will be covered in This Week in Toku starting next week. What did you guys think of this week’s shows? Leave a comment and let’s discuss!